Down River Equipment is the Source for All Your River Equipment. We have been manufacturing and supplying the best river equipment since 1985. Our company is owned by boaters and we employ an experienced team of boaters to assist with all your river needs. We specialize in the custom fabrication, distribution and retail of equipment for all types of river adventures. 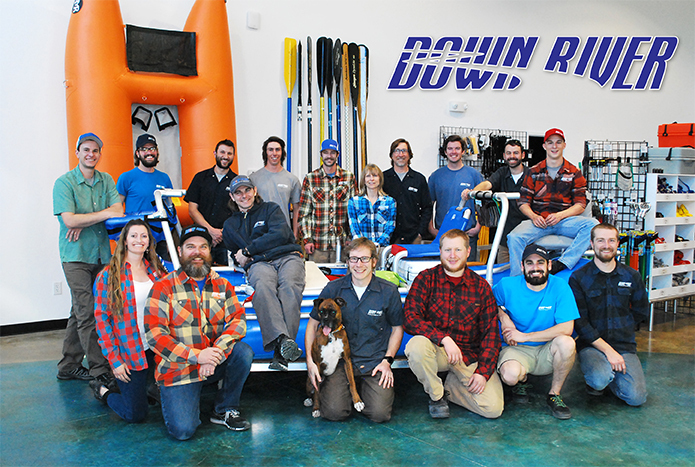 Down River Equipment is best known for our quality frames that are 100% made in Colorado. Along with our frames, we also manufacture dry boxes, tables, pumps and a multitude of cargo gear, all of our DRE brand gear is made in Colorado. Our experience and craftsmanship are the best in the industry. We distribute Hyside, AIRE, Rocky Mountain Rafts, Sawyer, Carlisle, Advanced Composite, Extrasport and Engel to name a few. If you are purchasing any of our frames, tables, dry boxes, or any of our custom made products, one of our well trained staff will follow up with you via email and phone. Our store is located just west of Denver, Colorado. We have a large showroom with boats, frames and products on display. We’re open year round and enjoy interacting with our customers on a face to face basis. We are a dog friendly establishment, so feel free to bring your furry friends into our store (dog treats are behind the front counter)!